Dies R Us: A Plum Purdy Christmas! When the days start getting shorter and the evenings cooler, it is a sure sign that summer is almost over & it won't be long before you need to start thinking about the holidays ahead. In past years, although my intentions were always good, I usually ended up doing a mad scramble toward the end of November to get all my Christmas cards made. Well, this year will be different! I've already started a few & intend to do several each week so I can enjoy the holidays this year! Hopefully, my card will get you enthused about starting your cards too! The image I used on this card is from Plum Purdy. I've had this one for years & I drag it out every single year just because I love it so much. 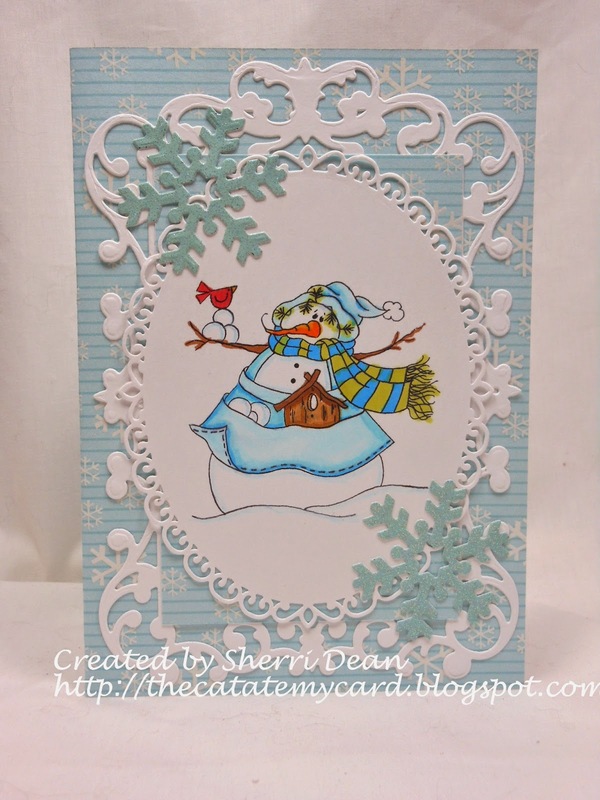 I think everyone loves snowmen! The outside frame is Spellbinders Reflective Moment and I cut the image out with Spellbinders Elegant Ovals. The beautiful snowflakes were cut from glitter paper with Spellbinders Create a Flake One. After you check out the daily posts on this blog for all the great ideas, be sure you head on over to the Dies R Us Challenge Blog! We begin a new challenge on the first & fifteenth of each month with a chance to win a gift certificate to our awesome store! You DON'T want to miss that!! I guarantee you there are so many awesome dies in stock that you will have a hard time deciding just which ones you can't live without! Until next week, I wish you happy crafting! Oh I LOVE this Christmas card... and I am so proud of you for getting a start on your Christmas cards. I told my self I would make some all year long as well..so far... not a one. This one is so beautiful in the non traditional colors and your delicious dies and outstanding coloring! One of my most favorite ones ever! BEAUTIFUL Sherri! You are so good with the blues &whites ... this design really makes your perfectly colored image POP too! Well done!